'Lincoln'- the 2012 biopic on the life of Abraham Lincoln- focuses on the final four months of his Presidential term in 1865, during which he steered the passage of the historical 13th amendment to US Constitution to abolish slavery. The 13th amendment abolished slavery and involuntary servitude, except as a form of punishment for crime on conviction by a court of law, and enabled Congress to pass laws to enforce abolition. Before that, the blacks were not regarded as full legal persons under the US Constitution. It did not expressly use the words slave or slavery but included several provisions about unfree persons. Article I, Section 2, Clause 3 of the Constitution, allocated Congressional representation based "on the whole Number of free Persons" and "three fifths of all other Persons". Thus, the Constitution treated them as three-fifths of a white American citizen. They were understood as property. Interpreting the Constitution, the US Supreme Court held in Dred Scott v Sandford (1857) that blacks cannot claim full rights of an American Citizen. This decision was widely denounced, triggering off public debates on abolition of slavery. In this backdrop, Lincoln, who had taken an open anti-slavery stand, was elected President for the first time in 1860. His election was followed by the announcement of secession by southern states, who wanted to retain slavery. They claimed that abolition will affect their economy, as their main source of income- cotton cultivation- heavily depended on slaves. The seceded states formed themselves into 'Confederate of States'. A civil war erupted between the Union and the Confederates. Lincoln, using his war-time emergency powers, issued an Emancipation Declaration in 1863, declaring the slaves of rebel states free. But, since it was an executive order issued during war-time, that too applicable only to states under rebellion, Lincoln was apprehensive about its legal sustainability after the war. Therefore, he pushed for a permanent solution, to accomplish the freedom of slaves, once and for all – the Constitutional Amendment! That set the stage for the dramatic events, which are the subject of the movie. Seeing constitutional liberties printed in the black and white evokes a sublime feeling. But the translation of the idealistic thought to the printed letter of law might have taken the course of a less honourable journey. At play in the background of major legal reforms is the grind of realpolitik, which may not appeal to those who are morally high-perched. The focus of the movie is on political games which led to the passage of the amendment. The movie is adapted from the biography "Team of Rivals: The Political Genius of Lincoln" by Doris Kearns Goodwin. Lincoln is depicted as a political genius, who applied stratagem with craft to realize his idealistic vision. "I want to procure the votes. Come February, I want to sign the proclamation", he is shown as asserting in the beginning of the movie. And he uses all his tricks in the sleeve to achieve it. He persuades, woos, orders, enthrals and even coerces members, with his lawyerly skills, masterful oratory, personal charisma, force of character and also the authority of his office. Also, he is not loath to offer the lure of office to sway Democrats to the side. Yes, behind the historic amendment there were a lot of "games and tricks" played, including horse-trading. In an early sequence, he is shown explaining his reasons behind the Emancipation Proclamation. It was issued using his war powers to confiscate 'property' of belligerents. Lincoln used the confiscatory powers to set free the slaves of rebel states. But, it also meant that he had to accept that slaves were property in the first place. This was at odds with his higher concepts of equality. Yet, he "caught the opportunity" to give freedom to slaves within the then existing legal framework, though acknowledging that the reasoning was "slippery". "My oath demanded the action", said Lincoln. Some of his colleagues thought that he was dictatorial, "ignoring courts and twisting meaning of law" to force his views. Those in the camp of radical abolitionists thought that he was too vacillating and not forceful enough, calling him the "capitulating comprimiser". Thaddeus Stevens(Tommy Lee Jones), a radical Republican advocating abolition, criticised Lincoln's attempts to push the amendment by taking the Congressmen into confidence. Stevens said that the "inner compass, that should direct towards justice, has ossified in white men" and that "they cannot bear the thought of sharing the country's infinite abundance with negros". Lincoln responded: "A compass, I learnt when I was surveying, it'll... it'll point you True North from where you're standing, but it's got no advice about the swamps and dessert and chasm that you'll encounter along the way. If in pursuit of your destination, you plunge ahead, heedless of obstacles, and achieve nothing more than to sink in a swamp... What's the use of knowing True North?" This summed up his mindset. Though his eyes were set high at the north pole of idealism, he knew that he has to tread the treacherous path on the ground. His political prudence informed him that adopting a radical position will not ensure the passage of the amendment. To win the support of the conservative block, he agreed to enter into peace negotiations with the Confederacy states. But, there lied a catch. He had to present the amendment as a militaristic necessity to end the civil war. A declaration of peace will erode support for the amendment. Yet, he had to agree to enter into negotiations, which were carried out in secrecy. Letting its news out would have taken the wind off the sails of amendment. So, the passing of amendment was also a race against time, as it had to be realized before any concrete peace proposal getting fulfilled. "I want to wrap the whole slavery thing forever, as soon as I am able, now", Lincoln declared in the beginning, based on the apprehension that the men he freed at wartime might be ordered back to slavery if there is no constitutional backing given to his Proclamation before the end of war. The Bill had to face tough opposition in the Parliament. It was termed as against "natural law"
"Congress must never declare equal those who God created unequal", exhorted the orthodox block in the Congress. They also voiced the apprehension that the amendment will entail giving voting and property rights to the blacks. To tame the opposition, Stevens of the radical wing, was advised to temper down his stand. Out of pressure from Lincoln's office, he said that amendment was aimed at only "equality before law" and not to recognize "equality of races in all aspects". Lincoln reckoned that society would find reforms in a gradual phase more acceptable. While dealing with the political maelstrom, Lincoln was also fighting internal personal battles as well. He and his wife Mary Todd(Sally Field) were yet to reconcile with the death of their son few years ago. At moments overcame with grief, they had only each other to look for support. Another battle on the personal front was in dealing with his adolescent son Robbie. He wanted to enlist with military service, forsaking the privileges of President's son. But, Lincoln's wife was sternly opposed to the idea. This makes Lincoln caught up in a dilemma : the success of peace negotiation will end war, avoiding the situation of his son having to fight war; but end of war could sound death knell to the amendment. When the amendment was being debated, Lincoln, the master strategist who pulled all the strings behind the curtain, is shown as resting peacefully in his office with stoic detachment. Then the bells toll, announcing the passing of the bill, and Lincoln rises up, greeting the historic moment with a simple smile. During the debate, the news of peace commissioners attempting negotiation got leaked to the Congress. The members demanded postponement of the vote until President clarified on this. The Speaker requested for a statement by President on this. Lincoln shot a deft reply that "so long as I know, there are no Confederate commissioners in Washington"(they were in fact cooling their heels at the outskirts of Washnigton). Lincoln got away with lawyer-like evasion. Thus, the amendment was passed with a lot of sleight. "The greatest measure of the 19th century was passed by corruption, aided and abetted by the purest man in America", commented Stevens on the passage of amendment. Yes, though the means were not exactly above board, the intentions were noble. Explaining his thought behind the amendment, Lincoln at one stage quoted Euclidean theorem that things which are equal to the same thing are equal to each other. "Equality is the origin. That's balance, fairness and justice", he said, emphasising that equality was the most natural of the laws. Though the political machinations and legislative process are dense with action, director Steven Spielberg ensures that the tone of the movie does not rise up to melodrama. Daniel Dey Lewis delivers a stellar performance as Lincoln, bringing out the external simplicity and inner complexity of the man with panache. 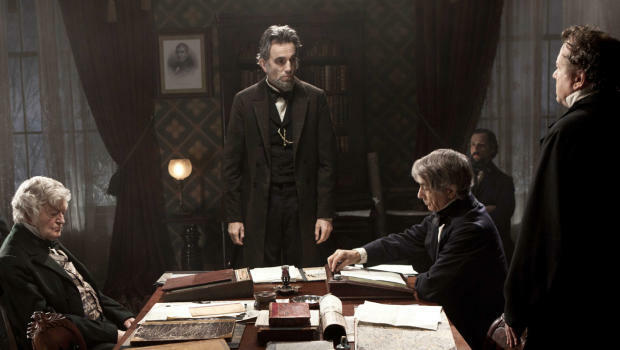 'Lincoln' depicts how deep-rooted mental prejudices shape legislative process. It is educative and entertaining. As a work of art, it is deeply enjoyable for its restrained drama, top-notch performances and masterly depiction of the human strife for progress and evolution.